Buswells is an elegant 3 star hotel with special character in the heart of Dublin 2. A charming 67-bedroom Georgian hotel, we are ideally located in the centre of Dublin city. A short stroll from St. Stephen’s Green, Trinity College, Grafton Street and many other visitor attractions. We are one of the oldest hotels in the city and comprise of five Georgian townhouses. Our unique hotel has operated since 1882 and remains a focal point in Dublin. 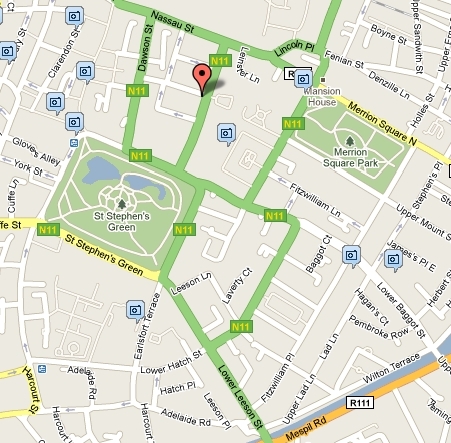 The Gaiety and Olympia Theatres, Dublin Castle and Temple Bar are all located nearby. Location: Complimentary parking is paid by the hotel in Dawson Carpark from 5.30pm to 9.30am Monday – Sunday. Bank holidays may differ so please check with the hotel. Outside of these hours, the cost is €3.00 per hour. Restaurants: For a fine dining experience in a timeless relaxed atmosphere, then why not book a table at Trumans Restaurant. Displaying a fine sense of elegance, Trumans Restaurant at Buswells offers one of the most engaging dining experiences in Dublin city centre. Dress code is smart casual Niall Whelan, our executive head chef, regularly creates new and exciting menus to cater for all tastes. Using the freshest of Irish ingredients, they create a blend of local, regional and international dishes. Buswells Bar is a traditional style bar with a warm friendly atmosphere. Relax in a quiet setting, vast leather armchairs and enjoy a drink or light snack with colleagues or friends. Looking for a quick and tasty snack during the day or after work ? Try our extensive Bar food menu which is available each day from 8am to 9.30pm.